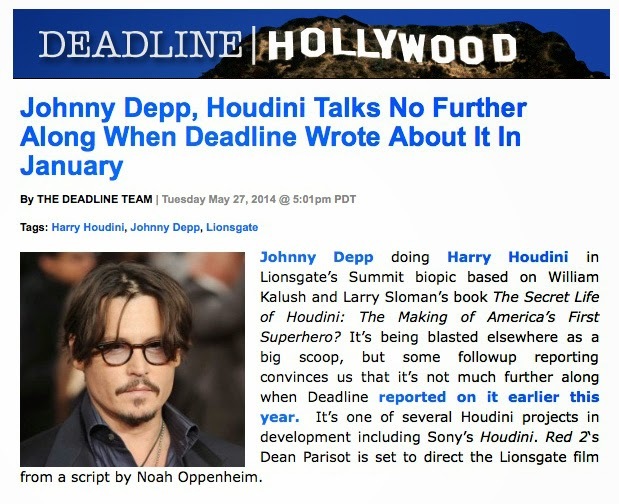 Deadline Hollywood has thrown some cold water on The Hollywood Reporter's "exclusive" yesterday that Johnny Depp is in negotiations to play Houdini in Lionsgate's The Secret Life of Houdini. Deadline says that the talks are "not much further along" now than back in January when Deadline first reported this news. I do trust Deadline over The Hollywood Reporter for news. As I stated in my own post yesterday, The Reporter has rushed several Houdini "exclusives" into print lately that have proven to be extremely premature and have gone nowhere. And should we be suspicions about the timing? Odd that this big Houdini news would hit the day after HISTORY officially launched the promotional campaign for their Houdini miniseries with Adrien Brody. It wouldn't be the first time this project made a timely reappearance.